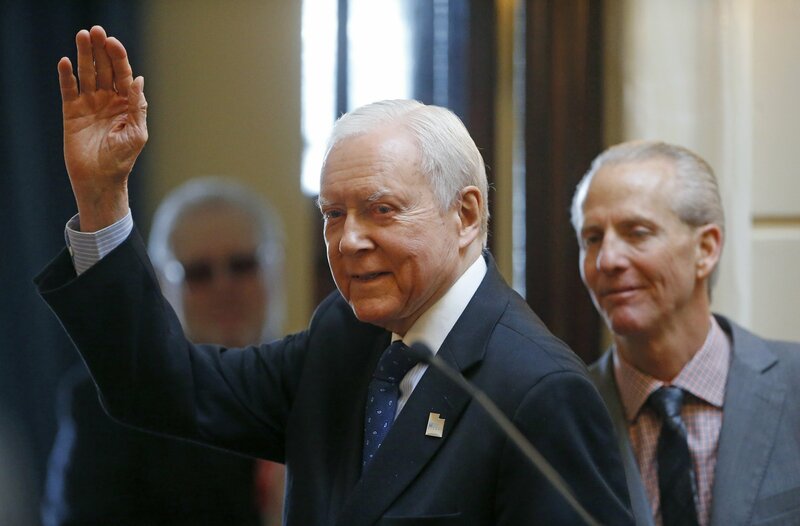 SALT LAKE CITY — Orrin Hatch ended his tenure Thursday as the longest-serving Republican senator in history, capping a unique career that positioned him as one of the most prominent conservatives in the United States. The departure of the vocal supporter of President Donald Trump ushers in another outsized Utah voice with a very different take on the president: Mitt Romney, whose renewed criticism of Trump is already making waves. Romney was sworn in to the U.S. Senate seat from which Hatch is retiring after four decades and at the height of his power. A staunch conservative who wasn’t afraid to cross the aisle, Hatch teamed with Democrats to pass the Americans with Disabilities Act and the Children’s Health Insurance Program for low-income kids. He also championed GOP issues like abortion limits and played a major role in shaping the U.S. Supreme Court, including defending Clarence Thomas against sexual harassment allegations during confirmation hearings. In recent years, the 84-year-old helped pass a federal tax overhaul, pushed for Trump’s divisive decision to downsize two national monuments in Utah and called for a return to an era of political civility. Hatch, who did not agree to an interview with The Associated Press after several requests over the last month, was a fresh-faced trial lawyer from Pittsburgh when he narrowly upset Democratic Sen. Frank Moss in 1976. He was a newcomer who appealed to the right wing of the Republican Party, University of Utah political science professor Tim Chambless said. His candidacy got a boost from an endorsement by another conservative rising star, Ronald Reagan. After Hatch took office, he quickly secured a place on the Senate Judiciary Committee, where he would serve for decades. He has participated in the confirmation hearings of every current Supreme Court justice, including the contentious ones of Thomas and Brett Kavanaugh. The senator famously defended Thomas during confirmation hearings by reading aloud from “The Exorcist” to suggest Anita Hill lifted details of her sexual harassment allegations from the horror book. But Hatch also recommended President Bill Clinton name Ruth Bader Ginsburg, a liberal, to the court. “Few senators can claim a fraction of the influence of Orrin Hatch on the direction and makeup of the United States Supreme Court,” George Washington University law professor Jonathan Turley said in an email. Hatch, who learned to box as a child and later made friends with Muhammad Ali, didn’t back down from rhetorical battles but also formed friendships with political opponents, particularly the late Sen. Edward M. Kennedy. He highlighted his ability to work with Democrats in a short-lived campaign for president in 2000. But Hatch strongly opposed President Barack Obama’s signature health care law and more actively courted the conservative wing of his party after his colleague, Sen. Bob Bennett, was ousted in a tea party wave in 2012. Hatch would later use his clout to help Trump push a major GOP tax overhaul and cheer the president’s decision to downsize the Bears Ears and Grand Staircase national monuments in a win for state Republicans. The senator also made waves in copyright law, helping make it a crime to illegally download music at a time when it was considered a serious threat to the music industry. Hatch is a songwriter himself, and one of his tunes went platinum after appearing on a compilation of Christian pop music. A member of the Mormon church, Hatch has said legislation protecting religious freedom is his greatest accomplishment. He has called for lawmakers to find ways to allow people to practice their faith while shielding the LGBTQ community from discrimination. In his farewell speech last month, Hatch bemoaned the disappearance of political civility and challenged his colleagues to work constructively for the good of the country. “Things weren’t always as they are now. I was here when this body was at its best,” he said. In his final years in office, however, he’s apologized for using expletives to describe his political foes and backtracked after saying he wasn’t concerned that prosecutors have implicated Trump in a crime. Even so, Hatch is part of a rare breed that’s still able work with the opposing party, Utah State University political science professor Damon Cann said. Hatch is now expected to take a seat at the new Hatch Center library and think tank, which supporters have raised millions to build in Salt Lake City. “As long as he is able, he’s going to have motivation to try to be a player and be in the process,” said Chambless, the University of Utah professor.